Against a backdrop of rushing rain and piano music Lucyna Zwolinska presents us with the sight of three graceful Asian dancers confronting the impressive figure of a two-metre tall man. 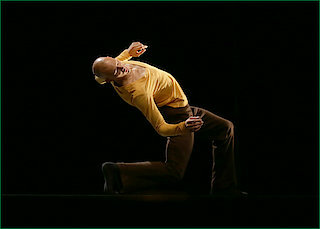 The young choreographer has given them all an attractive, made-to-measure language of movement. But she is interested in something more than precise timing and perfect bodily control: ”Droga“ is Polish for “Way“ – and throws up basic questions. What moves us, drives us and hinders us? Zwolinska’s show was awarded the internationale tanzmesse 2014 presentation prize at the “no ballet” choreography competition in Ludwigshafen in 2013.